His Holiness the Je Khenpo arrived in Rajgir in Bihar, India today to preside for a weeklong Moenlam Chenmo, which will begin on November 12. His Holiness was received by the Agriculture Minister of Bihar Prem Kumar at the airport. His Holiness is accompanied by three lopens and senior officials from the Zhung Dratshang. His Holiness will also preside over the Salang Tendrel or the groundbreaking ceremony for the construction of a Bhutanese Lhakhang and a guest house for the Bhutanese pilgrims in Rajgir. It is part of the 50 years celebration of Bhutan-India friendship. The government of India has granted two acres of land in Rajgir to the royal government to build a Bhutanese temple and a guest house in 2010. 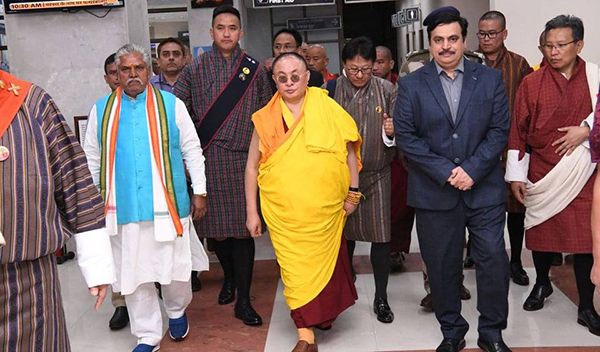 Earlier this morning, His Holiness was seen off at the Paro airport by the Prime Minister Dr Lotay Tshering, other cabinet ministers, Indian Ambassador and senior officials.